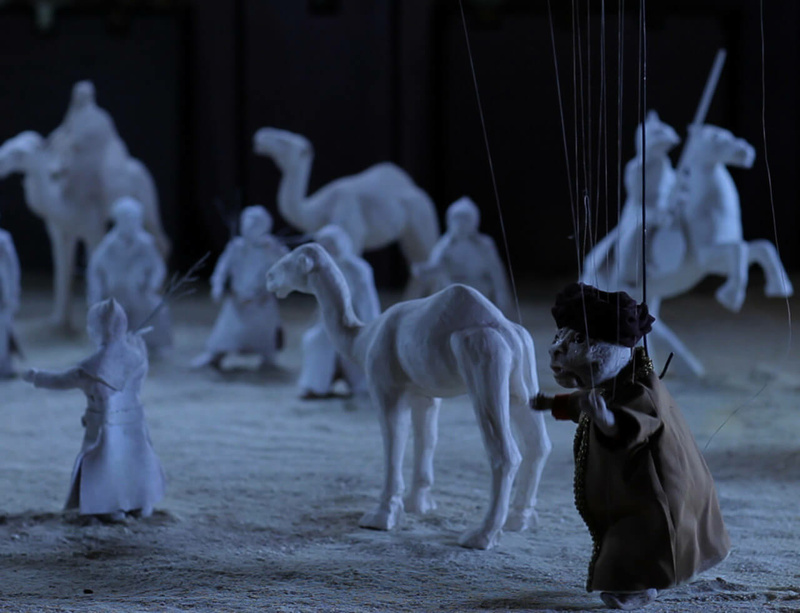 Cabaret Crusades is the title chosen by the Egyptian artist Wael Shawky for his video trilogy, which depicts the events of the medieval crusades from an Arab perspective, and in which historical figures are embodied by marionettes. “I am fascinated by historical texts as human creations; I want to transform them into a new kind of creation." Parts 1 and 2 of the trilogy (The Horror Show File, 2010 and The Path to Cairo, 2012) were exhibited at dOCUMENTA 13 in Kassel. Now, for his first major solo show in Germany, Shawky is producing Part 3 of Cabaret Crusades in the Kunstsammlung Nordrhein-Westfalen before the eyes of museum visitors. While the first two parts of the series, initiated in 2010, can be viewed in one section of the Grabbehalle in the K20, alongside the marionettes themselves, the third installment of this epic trilogy, entitled The Secrets of Karbala, takes shape just a few feet away. Shawky’s most elaborate film production to date, the new work will receive its premiere screening on December 4, 2014 in the Kunstsammlung Nordrhein-Westfalen.